 Stolpvagn R10 typ DB "Museum 2017"
Stolpvagn R10 typ DB "Museum 2017"
By buying this product you can collect up to 6160 bonuspoints. Stolpvagn R10 typ DB 'Museum 2017' 'Sommerfeldt', med olika laster, längd över buffertar 37,5 cm, epok III. 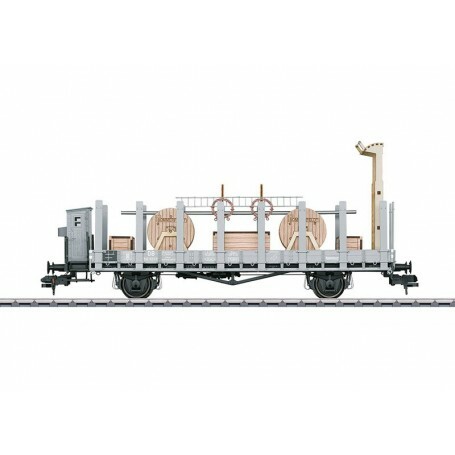 Model: The stake car has many separately applied details such as brake air lines, brake air tank, rigging, brake shoe holders, and brake crank. The car has an extensive paint scheme.The load is a laser-cut catenary construction cart made of real wood. Length over the buffers 37.5 cm / 14-3/4'. Prototype: Association design stake car (R10) with hand brakes and a brakeman's cab, equipped for catenary construction (so-called 'drum car') painted and lettered for the firm Sommerfeldt, Hattenhofen, Germany near Göppingen, used on the DB. Car number 512 523. Available only at the Märklin Museum in Göppingen.